This week we have released Homey v1.2, a free software update for all Homey users. The flagship feature of this release is Homey Music, which we are very proud to finally share with all of our customers. Update June 2018: since this update, we have revised our vision on the role of Homey with regards to music in your home. Please read the new blog post about Homey and Music for an up-to-date image. Homey Music combines speakers of various brands, e.g. Sonos, with music services such as Spotify and SoundCloud. And best of all, you can create Flows to upgrade your house from a few connected products to a true smart home. This blogpost will go in-depth about the inner workings of Homey Music, to give some insights in how, and more important why we have designed the feature in a certain way. At Athom, our goal is to connect everything at home, regardless of the brand or technology. We believe that everyone should have freedom of choice, and be able to get creative with their own purchases. We have solved this for Home Automation in the last year, and we have been very successful at it. Now we are doing the same for music. Nowadays there are various smart speakers, such as Sonos, Denon Heos, Google Chromecast, etc. On the other side, there are music services, such as Spotify, Google Play Music and SoundCloud. We have found that combining those together is hardly possible, and automating them in your home is still a wish for many. So that is why we have decided to fix this once and for all, with Homey Music. Homey Music allows you to mix & match speakers and services the way you like it. Currently we support Sonos, Denon Heos, Google Chromecast and Homey’s line-out to playback music, and Spotify for Sonos, Google Play Music and SoundCloud as services, and the number of music apps are growing fast by our enthusiastic community. 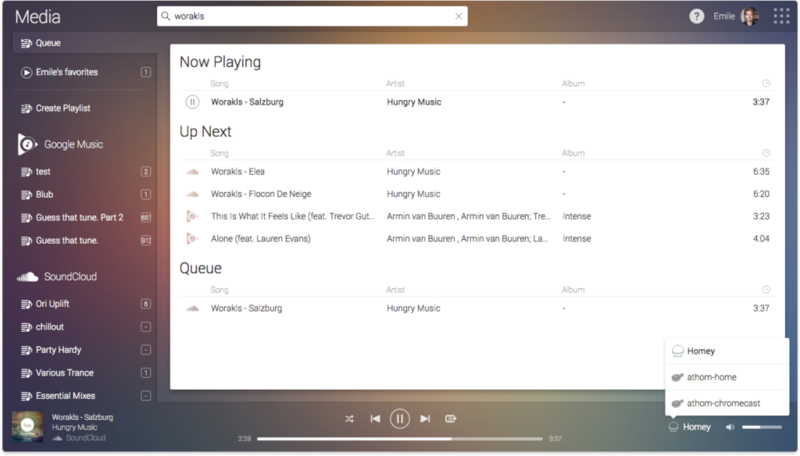 In the Homey Desktop App you can create mixed playlists that consist of tracks from any music service. For example, a ‘Party Tracks’ playlist with some Google Play Music tracks, a few mixes from SoundCloud and that unique track only available on Spotify. After updating to Homey v1.2, the Homey Smartphone App will automatically show a ‘Music’ item in the menu. Opening it presents a mobile interface where you can control the playback, find tracks, switch speakers and adjust the volume. Wake up gently with a morning playlist by creating a Flow. As of Homey v1.3 (which is currently in testing) we will introduce Homey Alarms, which work amazingly well together with Homey Music. At our office we’re far from a 9-to-5 mentality, so we built a kitchen where we eat together. It didn’t take long until we found that dinner music really boosted the atmosphere. So we created a Flow that measures the power usage of our cooker hood, and when someone’s done cooking the power usage drops instantly. Then the music automatically starts playing, the lights are dimmed and every employee gets a push notification that dinner’s ready! Software is never finished, and however Homey Music is a major milestone in our development, we still have a lot of wishes for the future. One of them is to include Spotify support on all devices, not only on Sonos. We are in contact with them, yet they haven’t been very cooperative yet, as their main interface is Spotify Connect. If we’d were to integrate their solution in Homey, all automation and mixed playlist support would not work, and that’s a concession we’re not willing to make. Especially because the larger companies out there do not have to work with these limitations. It feels like David vs. Goliath, and we’re not giving up! Currently, some brands support grouping of speakers. We’d like you to be able to do this from within Homey as well. Especially creating a Flow for these actions can be very useful at times (“OK Homey, party mode!”). The mobile app doesn’t support finding and editing playlists yet, and that’s something we’re working on as well. In one of the upcoming updates, we will add support for Bluetooth speakers as well. Update June 2018: Due to a change in roadmap, speaker groups, playlists in the smartphone app and Bluetooth speakers will not be developed.